U.S. Rep. Michele Bachmann has everything a cable TV talk show producer wants. Attractive and outspoken, she's reliably controversial. But in some instances, Bachmann is also wrong. "We know that within just a day or so that the President of the United State is taking a trip to India that is expected to cost the taxpayers $200 million a day," Bachmann told CNN's Anderson Cooper. But that number was wildly overstated, White House officials and independent analysts said. In 2007, she said this about the Middle East: "Iran is the troublemaker, trying to tip over apple carts all over Baghdad right now because they want America to pull out and you know why? It's because they've already decided that they're going to partition Iraq," Bachmann told the St. Cloud Times. After other government officials said they knew of no such plan by Iran, Bachmann backed off, saying she was only speaking in general terms. Her misstatements aside, Bachmann is a star. She has become a mainstay on cable TV networks like Fox News, CNN and MSNBC. Bachmann also is a frequent guest on talk radio, including Minnesota Public Radio News, and travels the country speaking to Republican groups. She will be in Iowa tonight to speak to an anti-tax group, a trip that is receiving a lot of attention because Bachmann hasn't denied speculation she may run for president next year. Over the past year, Bachmann has often criticized President Barack Obama, the newly enacted health care law and the growing federal deficit. She comes armed with assertions, figures and graphs to make her point. But independent fact checkers find that the information she relies on is often exaggerated, misleading or wrong. PolitiFact, a Pulitzer Prize-winning feature of the St. Petersburg Times that checks whether statements made by politicians are true, has repeatedly determined that Bachmann's claim don't ring true. "We have checked her 13 times, and seven of her claims to be false and six have been found to be ridiculously false," PolitiFact editor Bill Adair said. Adair said no politician has been checked as often as Bachmann without saying at least something that's true. "I don't know anyone else that we have checked, more than a couple times, that has never earned anything above a false," he said. "She is unusual in that regard that she has never gotten a rating higher than false." Adair is careful to say that he expects to someday fact check a Bachmann statement that turns out to be true. He said his organization selects statements that it thinks the public would be curious about. PolitiFact has been tracking Bachmann's statements since 2009. Bachmann typically recites claims that were initially made on blogs or in chain e-mails, Adair said. However, it appears that the fact checks have not prompted her to be more cautious with her rhetoric. In a nine-minute interview with Bachmann on Minnesota Public Radio News' Morning Edition program earlier this month, Bachmann made at least four misleading or false statements. For example, she suggested the new federal health care law is the main reason health insurance premiums have increased across the country. "I know a friend of mine who's from Minnesota who has recently moved to California who is a young widow," Bachmann said. "She told me her premiums have just gone up 29 percent. Well, that makes sense because of all of the unfunded mandates in ObamaCare. Now the private insurance companies are picking them up." But that claim is a stretch, said Larry Levitt, vice president of the Kaiser Family Foundation, which studies health care issues. Levitt said health care premiums have increased, but it has nothing to do with the new health care law. He said the new law has had a very modest effect on the cost of coverage. "There have been reports recently of insurers raising premiums significantly, but that's due to the increase in the cost of health care, which is continuing to rise, and the effects of the economic downturn," Levitt said. Bachmann also claimed that illegal immigrants will have access to health insurance under the new law. That also is false. Emergency rooms are required to treat everyone, no matter what their immigration status. But that's been the case for years. People who are in the country illegally aren't eligible for health care under the federal Medicaid program or the new insurance exchanges the law creates. Bachmann also said in the interview that Christina Romer, the former chairman of the White House Council of Economic Advisers, had warned that five million jobs would be lost under the health care law. PolitiFact and other organizations say Romer never made that statement. The fact-checking group found that Republicans arrived at the number by misusing research Romer conducted in 2007. When MPR News asked Bachmann this week to discuss the many challenges to her credibility, the congresswoman dodged the question. Instead, she questioned the truthfulness of President Obama -- saying he has misled the public about the federal stimulus and the health care law. "President Obama gave us the opposite information," Bachmann said. "That's where the fact-checking needs to be held, because President Obama needs to be held accountable for not telling the American people about all of the failures that have come along." 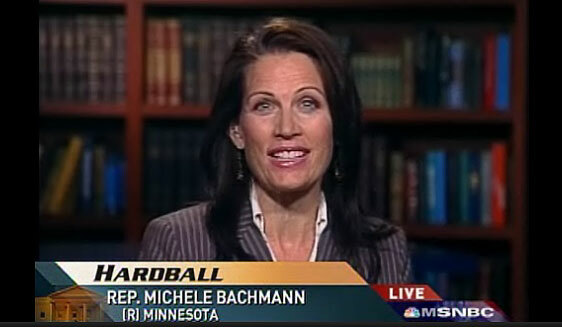 Bachmann then went on to repeat her earlier misstatements. If Bachmann makes a run for the presidency, she is sure to step up her media appearances and speaking engagement -- which would invite additional scrutiny. But that may not mean Bachmann will take more care with facts. Norm Ornstein, a congressional scholar with the American Enterprise Institute, said politicians have become increasingly dismissive of facts. "Respect for facts just doesn't mean a whole lot any more," Ornstein said. "You don't get punished. You don't get shamed if you say things that are patently false. Let's face it: for many, repeating them over and over again -- even after you've been told and it's been made clear that what you say is false -- just doesn't have any impact at all." Bachmann's misstatements haven't hurt her in her district. She was re-elected with more than 52 percent of the vote in November, and she raised a record amount of cash for her campaign from supporters both in the state and around the country.